I had received a pair of CB “walkie talkies” the Christmas of 1965. Through these I had become friends with a fellow classmate who also had a pair and we, with the help of a few extra feet of wire, were able to talk to one another. We were both 13 and he told me he had a General class license in amateur radio. After a few months of some ‘elmering’ by he and another ham I got my Novice license in the summer of 1966 with the callsign of WN4ETG. I knew I needed to put up some HF antennas and so started the design on my first dipole setup. My dad owned a Chevrolet dealership in the small southeastern Kentucky town where we lived and was more than supportive of the new found hobby as will become evident later in this story. My family lived in an apartment over the dealership which backed up to a large creek named Troublesome. It was about to live up to its name. The apartment roof was 26’ above grade and the car lot beside the garage was 130’ long but all of the trees were on the other side of the creek. Being from a small town it was no problem to go ask the owner of the hillside on the far bank of the creek if we could use their timber for the far end support of the antennas. With all the territorial obstacles out of the way, all we had to do was figure how to support the antennas from the roof of the apartment. My Dad saw this as his opportunity to help and offered the services of the mechanics to weld a support for the antennas. I made some measurements and we decided that the length from the front of the garage to the other side of the creek was conducive to supporting an 80 meter and 15 meter dipole end to end. We had already purchased the wire at a local hardware store and were going to use rubber insulated #8 stranded copper. The support design my Dad had come up with was to use a 1 ½” galvanized steel pipe ‘T’ type structure, 5 feet tall, welded to a 3/8” solid steel plate. The structure would be secured to the roof with lag bolts and guyed in 3 directions with 1/8” cable. We made it a ‘T’ configuration so we could also install a 40m dipole off the other end of the ‘T’ across the roof of the garage which was 110’ long. The day came when my friend and I were to install the dipoles across the creek. He wasn’t going to be able to come by for a couple hours so I thought I would get things started. I needed to get the ‘far’ end of the antennas off the roof of the building so I proceeded to throw it off the roof. I must have been a little stronger than I thought because I threw it across the width of the car lot and onto the hood of a new red 1967 Chevy Impala. When I got down and observed the damage I discovered I had broken the windshield with one of the dogbone insulators. Time to go in and tell my dad. I did the song and dance routine and somehow he was okay with it. I couldn’t believe how he took it. Just an accident. RIGHT! Soon my friend showed up and we proceeded to complete the installation. With one end of the antennas secured to the ‘T’ structure we were going to use a large pulley and two steel engine heads for the counterweight. Once all the wire was strung across the creek, thru the pulley and the motor heads were attached I saw we had a large sagging problem. As my friend and I were putting the antennas up I saw my dad showing two new Chevy Impalas to prospective buyers. Just as they left, to go inside to discuss a possible purchase, I thought I could get rid of the sag by standing on the motor heads. I stood on them and the antennas came up some but not as much as I would like. So I jumped on them. The next thing I know I’m sliding down the hill side with the weights while hearing a crashing sound on the other side. I looked back and my friend is standing there frozen stiff with a strange grimace on his face. That was my first experience of seeing someone in total shock. I will never forget it. We can see that the ‘T’ support is on top of the hood of one of the new cars. After we crossed the creek my friend said he had to go home. I wished I could have gone with him. I went to observe the damage. The support had cut a hole through the hood of one of the new cars, somersaulted and went through the windshield of the other car damaging the dashboard. Okay I thought, I’ve destroyed almost all of my dad’s new car inventory in a single day. Time to go in and tell my dad the bad news again. Thinking the whole time I was going to meet my maker for sure at an early age, once again I did the song and dance routine and somehow he was okay with it. AGAIN. After some inspection of the support, he decided that the guy wires weren’t strong enough and that the steel plate had been overheated and crystallized during welding. 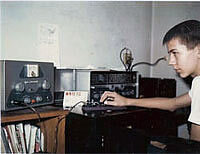 That was 40 years and many antenna projects ago. As I look back now I guess it turns out my dad was my best elmer.